The programme has been designed to improve hand and eye coordination and is the perfect way to introduce your child to futsal, the game that helped develop the likes of multiple Ballon d’Or winners Messi & Ronaldo and world record signing Neymar. All sessions will be held indoors in a warm and safe environment and will focus on your child, making new friends, learning new skills, teamwork, learning Spanish and most importantly having FUN. 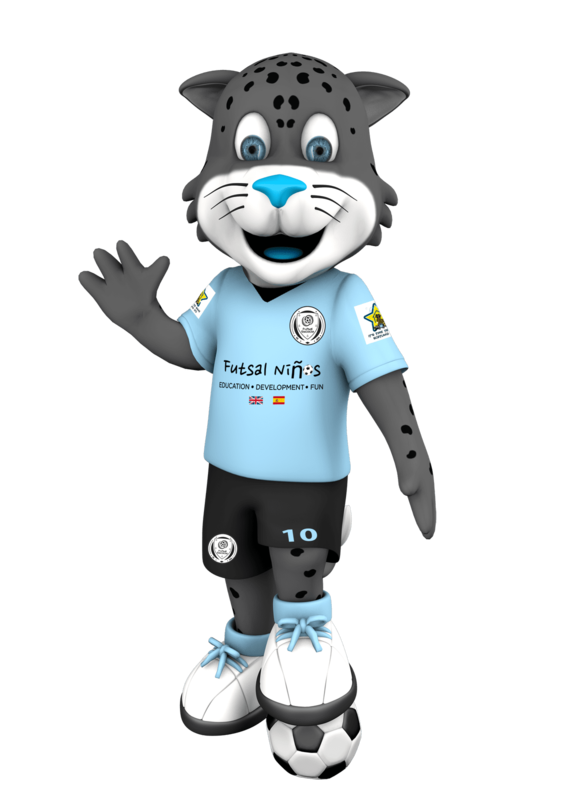 Every block will include a visit from our new friendly mascot, Ricardo the Jaguar who like futsal originated in South America. All our coaches are disclosure checked, first aid trained and have experience in working with young children. The sessions are open to boys and girls aged between 3-5 years of age and are used as a stepping stone to the Futsal Escocia Beginner Coaching sessions (5 years and above). Parents and children can continuously learn Spanish via the learning zone section of the website. Please keep a look out on the website for venues, times and session prices. If you’d like to register your child please contact us here. We are delighted to launch our NEW Niños programme for 3-5 year olds. Futsal Escocia birthday parties offer a terrific and fun option for your child’s birthday. The hour is based around futsal and fun and exciting games. Allow the children to celebrate their special day with friends and family, in a safe and fun environment, while the parents watch and relax. All coaching is conducted by disclosure checked and trained coaches. © 2019 Futsal Escocia | Futsal Scotland | Futsal Training Scotland. I am Ricardo and I am from Uruguay. I came to Scotland to help develop futsal, an exciting sport that originated in my homeland in the 1930’s. We are delighted to launch our NEW Niños programme for 3-5 year olds at venues across Fife!! The programme has been designed to improve motor skills and is the perfect way to introduce your child to futsal, the game that helped develop the likes of multiple Ballon d’Or winners Messi & Ronaldo and world record signing Neymar. Learn basic spanish with our NEW Niños programme for 3-5 year olds.